The natal horoscope of Ivanka Trump is rated X for 'date without time', same for her husband Jared Kushner. Both were born in 1981, a year of two major conjunctions--Jupiter-Saturn (3x: 4--10 Libra) and Jupiter-Pluto (once @24Lib53)--he on January 10, 1981 in Livingston, New Jersey, she on October 30, 1981 in New York, New York. 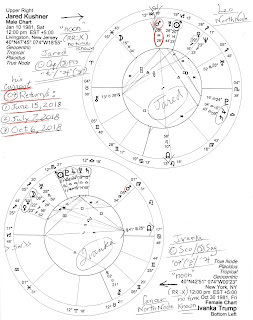 Below is a dual image of their natal horoscopes set for 'noon' with few of my usual scribbled astro-notes--primarily penned on are the three dates of Kushner's current Mars Return/s. However, if born at 12:00 am est or just after, his Mars is at 8AQ04 and the following Return dates change by one to three days. If born at or just prior to midnight, his Mars falls at 8AQ51 and his Mars Return dates differ by one to four days. Obviously, the Mars Return months remain the same and you will note that the transiting South Node, the tail of the dragon, has recently swiped Mr. Kushner's natal Mars in Aquarius no matter its precise degree suggesting his recent preference for isolation from public view and the lack of popularity for his actions. 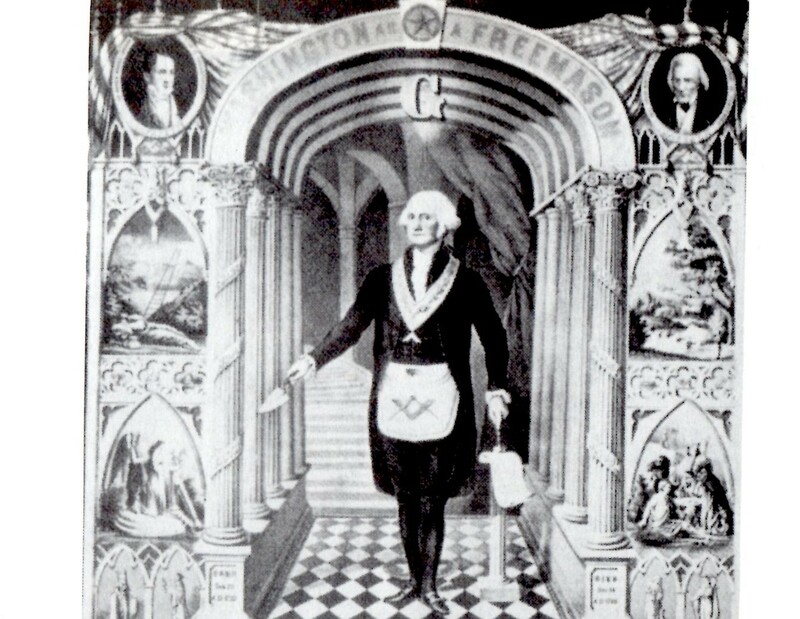 Jared Kushner Mars Return/s 8AQ28: 1. June 15, 2018; 2. July 7, 2018; 3. October 6, 2018. Transit Jupiter has been making a series of squares to his natal Mars denoting a period when common sense and moderation are needed for best results, and jumping to conclusions and the tendency to overestimate himself are best avoided. Significant is the fact that his Mars conjoins his natal South Node so every two years his Mars Return repeats that Saturnian connection which indicates a natural loner who won't consider the opinions of others when making decisions, and one whose actions and desires are often out of tune with those of society and are against cultural trends (Sakoian). 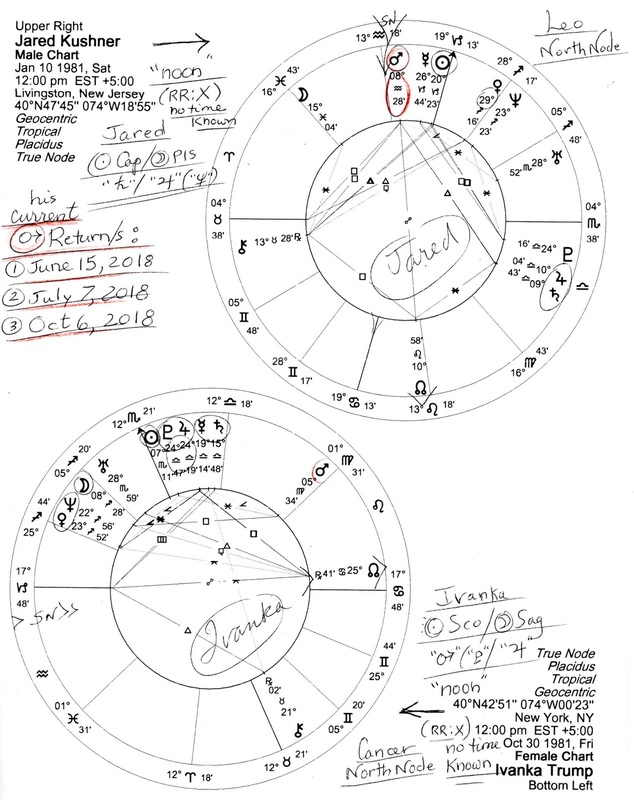 The timing also signifies a recent Nodal Return (10Leo/AQ) for Mr. Kushner, and interestingly, Vladimir Putin was also born with a Mars-South Node conjunction (see link, below). The Earth-Water Sun Cap-Moon Pisces blend of Jared Kushner is that of a romantic skeptic who is dependable yet private. Kushner may worry that he will be overwhelmed by his problems and he tends to second-guess himself. An introvert, he feels things deeply and suppresses his feelings which are kept to himself--and he tends to carry the burdens of others and is willing to bend truth. Image for Integration: "A wine collector uncorks a rare vintage to celebrate success." Ivanka Trump: Water-Fire Sun Scorpio-Moon Sag identifies Trump's daughter as an uncompromising, self-dramatizing, committed and passionate woman who "will hold back a trump or two when it comes to feelings" if she thinks it wiser. 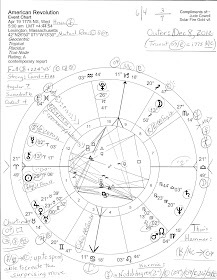 Sharing a sympatico Sag Moon with her father, Ivanka can be a stern judge, a paranoid introvert, and/or a spontaneous, outspoken extrovert who hates to be constrained. Her analytical mind makes her effective within group dynamics, plus, she's a natural psychologist and educator with a zeal for truth. A loyal if demanding friend, she does what she says she will do yet can have something of a Scorpionic 'sting' in her tail. Image for Integration: "Picasso's Guernica." Personality blends and Images: Sun Sign-Moon Sign by Charles and Suzi Harvey. 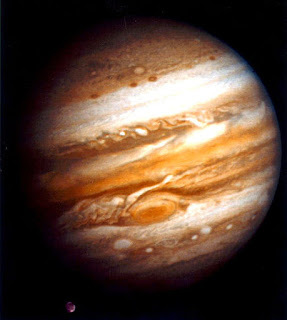 Related Posts include: The Natal Planets of Putin and Trump and In the Realms of Jupiter: Jared Kushner whose natal Jupiter in airy Libra conjoins his Saturn; however, note that Ivanka Trump was also born with Jupiter in Libra as was Donald Trump whose Jupiter conjoins Neptune and Chiron while Ivanka was born under a Jupiter-Pluto conjunction which obviously represents her wealth-worshiping father who mounts large-scale projects, applies for massive bank loans and other funding from abroad, and qualifies as a plutocrat.